Research on poverty and education shows that the majority of public school students in the United States qualify as poor, but you have the power to change their futures for the better. 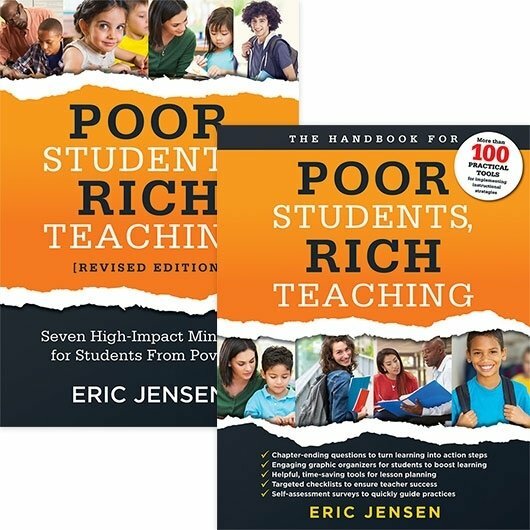 A companion to the revised edition of Eric Jensen’s Poor Students, Rich Teaching, this book for teachers provides a plethora of tools, organizers, worksheets, and surveys designed to help you fully embrace the mindsets in the classroom that lead to richer teaching. 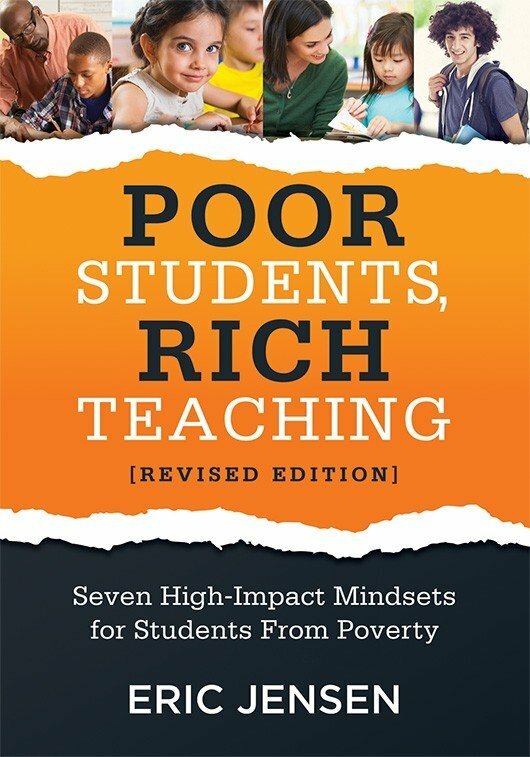 The core title for this book and its companion, Poor Students, Rich Teaching, Revised Edition, suggests they are about succeeding with students from poverty. But really, it’s about something much more than that: rich teaching. Here, the word rich means full, bountiful, and better than ever. Teachers can make a difference in students’ lives with richer teaching. They just need the knowledge and tools to do it. It’s also about developing the high-impact mindsets necessary to accomplish this. 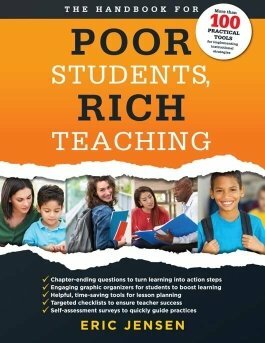 In Poor Students, Rich Teaching, Revised Edition, I establish the knowledge component of this equation—the research and strategies that high-performing teachers can use to defeat toxic narratives and help students succeed through richer and more abundant teaching. This handbook takes a tool-focused approach to these strategies. With a lesser focus on the supporting research, this book instead provides a plethora of tools you can use to help bring these strategies to life. There are graphic organizers for your students, brainstorming and worksheets for you to plan lessons, checklists to ensure you’re hitting all of a strategy’s key points, surveys to self-assess your current thinking and practices, and reflection questions to help you consider how you can change your practices (your teaching mindsets) to enrich your teaching. To kick things off, we’ll take a quick tour of how I’ve organized this book, how it works as a critical part of your teaching toolkit and how you can get the most of it. Then we’ll take a quick look at why these mindsets have such a high impact on bringing out the best in your students from poverty. This book’s major theme is developing the most powerful tool for change: mindset. A mindset is a way of thinking about something. As Stanford University psychologist Carol Dweck (2008) explains, people (broadly) think about intelligence in two ways: (1) either you have it or you don’t (the fixed mindset), or (2) you can grow and change (the growth mindset). Those with a fixed mindset believe intelligence and competency are a rigid unchangeable quality. Those with a growth mindset believe that intelligence and competency can develop over time as the brain changes and grows. This book broadens and deepens the mindset theme to many new areas of student and teacher behaviors that you’ll find highly relevant. It continues in seven parts, each highlighting a specific mindset with chapters that offer easy-to-implement and highly effective strategies and tools you can use immediately. Every part begins with a series of self-assessment questions to get you in touch with your current approach and thinking related to the mindset. Similarly, every chapter begins with a simple survey related to that topic. These are about understanding where you are starting from so that you’re ready to embrace the new thinking that comes from changing your mindset. As you dive in, you’ll find the strategies and tools you need to make these changes. Here are the seven parts. Each chapter and part ends with a series of reflection questions about the topic or mindset you just read and how your thinking on it has evolved. There’s much more for you to learn, but these seven high-impact mindsets and the accompanying strategies and tools will make a world of difference if you implement them well. That’s my promise. Before we get into part 1 and all seven mindsets for change, it’s important that I establish for you that these mindsets and strategies are not simply feel-good measures. They have the backing of years of research into how the brain reacts to poverty and how intervention counteracts poverty’s detrimental effects. You will find additional information in Poor Students, Rich Teaching, Revised Edition, that plumbs the depths of how pervasive poverty affects students and why, in America, it is all a part of a new normal that teachers must be prepared to confront. But for the purposes of this handbook, the key takeaway is that the brain is not set and even your most troubled students are not locked in to self-destructive cycles. The fact is, humans can and do change (Mackey, Singley, Wendelken, & Bunge, 2015). When people don’t change, it is often because others have given up on them, their daily environment is toxic, or others are using an ineffective strategy that doesn’t help. Often, teachers feel powerless to help students if there is a lack of support at home, but the truth is the classroom teacher is still the single most significant contributor to student achievement; the effect is greater than that of parents, peers, entire schools, or poverty (Hanushek, 2005; Haycock, 1998; Rivkin, Hanushek, & Kain, 2005; Rockoff, 2004). Given this, it’s important that we have a way to measure a strategy’s effect. In most sports, the team that scores the most points (or goals, runs, and so on) wins. This scoring system is simple and easily understood. In our profession, the scoring system that decides a winning classroom strategy is called the effect size. This number is simply the size of the impact on student learning. In short, it tells you how much something matters. The mathematics on it are simple: it is a standardized measure of the relative size of the gain (or loss) in student achievement caused by an intervention (versus a control; Olejnik & Algina, 2000). See figure I.1. 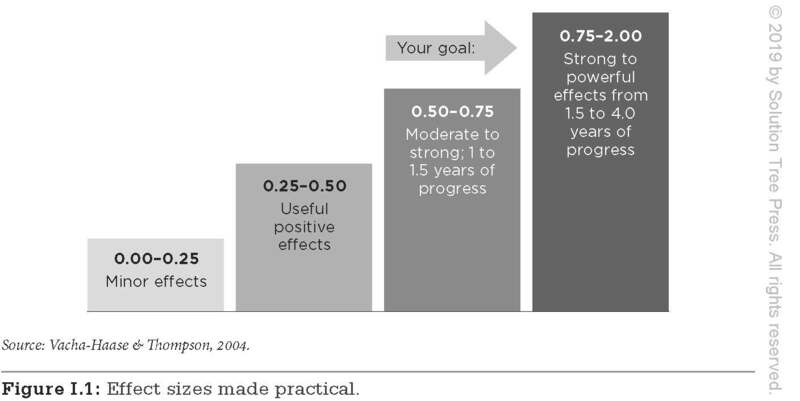 Figure I.1: Effect sizes made practical. Researchers simply measure the difference between doing something and doing nothing. Ideally, one uses an experimental group (using a new strategy) and a control group (using an existing norm). The strongest analysis includes large sample sizes and multiple studies with varied population demographics. Then, you know your data are very, very solid. Classroom interventions typically have effect sizes between 0.25 and 0.75 with a mean of about 0.40 (Hattie, 2009). One full year’s worth of academic gains has a 0.50 effect size, and two years’ worth of gains have a 1.00 effect size. This means that effect sizes above 0.50 are just the baseline for students in poverty. Teachers have to help students catch up from starting school one to three years behind their classmates, and it takes good instructional practices for effect sizes to be well above 0.50. To ensure students from poverty graduate, you’ll want to teach in ways that give them one and a half years’ worth of gains (or more) in each school year. What if, by just replacing one strategy you already use (for example, saying “Good job!” to a student) with another (a far more effective one, like “Your steady, daily studying really paid off. That’s going to help you graduate on time!”), you could get five to ten times the positive effect on student achievement? Not only do I show you how to do that in this book, I give you more than one hundred tools to help implement each strategy. An amazing journey is about to begin. Are you game? In this part, we begin with building the narrative of relationships as the core underpinning of high-performance teaching with students from poverty. Sometimes we find it easy to connect with students who share our own background, but it becomes much more challenging with students who don’t; yet it’s essential to build relationships with those students before any real learning can happen. If you’re not connecting by giving respect, listening, and showing empathy, you risk losing your students. When students lose interest in school, they will most likely find somewhere else to invest their energy and may make poorer choices. Some will get their respect and connections through peers and sports, others through drugs or even gangs. To begin this part, use Figure P1.1 (below) to self-assess how you already approach building (or not building) relationships with your students. As you think about your answers to these questions, it’s paramount for you to build your awareness that all of us are in this together—you, me, colleagues, students, and parents. Relationships between everyone that touches students’ lives affect their success. When your students succeed, you succeed. There is no us (teachers) and them (students). Maintaining an erroneous narrative of separation will ruin your chances of success in teaching. Figure P1.1: Assess your understanding of how poverty affects students. Visit this book’s web page for a free reproducible version of these questions. Consider the relationships you had with teachers when you were going through elementary and secondary school. What teachers did you feel connected to? Which did you have difficult experiences with? How did each affect your learning? When you stand at the front of your classroom and look out over your students, how do you feel about what you see? Do you feel connected or bonded with your students? Do you feel distance and separation? Why? Describe how you feel about your role in teaching. What is its scope? Do you see yourself purely as a subject-matter resource to impart knowledge? Do you consider yourself a source of emotional support? Consider all the students in your classroom. Do you know which students come from poverty and which do not? What are some of the challenges students from poverty face? What are some ways you’ve witnessed poverty affecting their behavior or academic outcomes? Do you feel empathy for the students in your class who come from poverty? What tools do you use to show students that you have an understanding of and empathy for their challenges? How do you ensure you make connections with students that foster empathy? Your students will care about academics as soon as you care about them. As neuroscience tells us, we are hardwired to connect (Commission on Children at Risk, 2003; Moriceau & Sullivan, 2005), and effective teacher-student relationships contribute to student achievement. Also, this contribution varies depending on students’ socioeconomic status and grade level. The research tells us that relationships mean more to students who have instability at home than to students who have a stable, two-parent foundation (Allen, McElhaney, Kuperminc, & Jodl, 2004). Among all students, good relationships have a 0.72 effect size, which makes them an exceptionally significant and strong effect size catalyst (Hattie, 2009). Among secondary students, the effect size is an even larger 0.87 (Marzano, 2003). The scope of the relational effect goes much further, and I explore it in depth in Poor Students, Rich Teaching, Revised Edition (Jensen, 2019). The bottom line is that relationships influence engagement in multiple ways. First, quality interactions within a relationship provide instruction, correction, modeling, and support for students, forming the basis of a teacher-student relationship (Hughes & Kwok, 2006). Second, a positive teacher-student relationship enhances students’ sense of classroom security and increases their willingness to engage in the classroom (Baumeister & Leary, 1995). Third, evidence shows that quality relationships can help students achieve more through greater connected engagement (Roorda, Koomen, Spilt, & Oort, 2011). Another study reveals that students’ positive or negative classroom relationships are equal to IQ or school achievement test scores in predicting if a student will drop out (Jimerson, Egeland, Sroufe, & Carlson, 2000). The next three chapters offer the following strategies to help you build relationships with your students that will get them on board emotionally and socially. In these chapters, you’ll see how relationships offer the emotional environment through which all course content flows. There is no classroom content without some sort of context, even if the context is a digital device. Let’s dig in. Each day, consider your own mindset for fostering connection and relationships with your students, and answer the following questions. Have I recently seen other teachers successfully build quality relationships with their students? How did they do it? Could I do something similar? Which students in my classroom have I not taken the time to get to know? In what ways can I connect with those students that will make a difference for them? Are there students in my classroom who appear to feel unsafe, not respected, or disconnected from their peers? How can I change those things?